Plenty of kid-friendly fun awaits in Overland Park, thanks to a variety of attractions and destinations that offer entertainment, education, recreation and even a few thrills! Looking for something active to entice energetic little travelers? They’ll have a blast exploring the sites and activities at Deanna Rose Children’s Farmstead, which replicates life on a turn-of-the-century Kansas farm. If you have thrill-seekers in your midst, try iFly Kansas City, indoor skydiving for ages 3 and up. 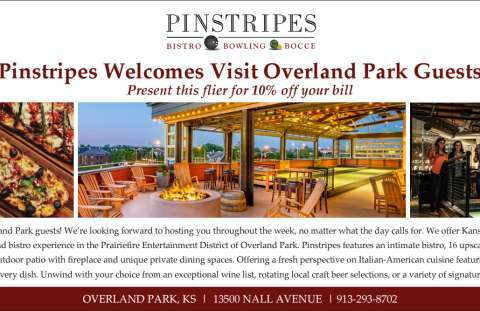 Family bowling night gets an upgrade at Pinstripes: Bistro | Bowling | Bocce, which also serves delicious Italian fare. Schedule note: Pinstripes offers tots playtime from 10 a.m. to noon, Monday through Friday, and parents bowl free. Or make plans to walk or bike along the Indian Creek Hike & Bike Trail, a scenic route that includes plenty of picturesque places to stop for a picnic. If your kiddos are the curious sort, they’ll love making new discoveries in Overland Park. Let them roam the hiking trails and gardens of the Overland Park Arboretum and Botanical Gardens, or get hands-on with history and science inside the Discovery Room at the Museum at Prairiefire. 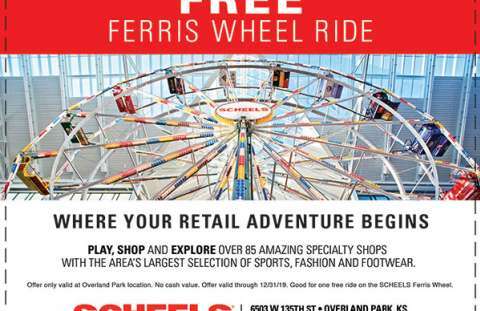 Inside Scheels, a mega sporting goods store, they can marvel at a 16,000-gallon overhead aquarium, hear from fully animated talking presidents along the Walk of the U.S. Presidents and ride an indoor Ferris wheel. And if your Overland Park visit falls on a Saturday from April through November, swing through downtown Overland Park and let your kids marvel at the delicious variety of produce and locally made goods available at the Overland Park Farmers Market. The market also hosts weekly events, ranging from live music and performances to free face painting and children’s book readings. Even more family-friendly attractions are just a short drive away throughout the Kansas City metro area. That’s one of the best things about Overland Park. It’s the perfect place for kids of all ages!